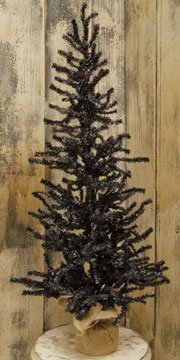 Our new black pine trees are perfect for creating wonderful fall displays. This short needled pine has an orange burlap wrapped base with a flat bottom, so you can display it on end tables or even use it as a table centerpiece. Choose from our selection of autumn-themed ornaments to create a unique fall display. 3 feet high. Ornaments shown are sold separately.